James Pope, the gentle-souled dweeb Kyle Mooney plays in Brigsby Bear, is an almost literal man-child, quite literally sheltered. Thirty if he’s a day, James still lives with his eccentric hippie parents (Mark Hamill and Jane Adams), but he has a good excuse: They’re all holed up together in an underground bunker, thanks to an unidentified catastrophe that’s made the air above unbreathable. James’ sole interest, his consuming obsession, is Brigsby Bear Adventures, a low-budget science-fiction serial he’s been watching his entire life; the show, which is basically Doctor Who by way of Barney, arrives like clockwork on VHS every week and features a time- and space-traversing bear whose exploits convey simple life lessons that seem to suspiciously advance in demographic aim as James ages. Any viewer paying attention may start to wonder about a post-apocalypse with Netflix services. Soon enough, we learn the shattering truth, at about the very moment James does: His parents aren’t really his parents, but two strangers who snatched him when he was a boy and raised him in captivity from there on out. The world above isn’t a toxic wasteland, just the California desert. And Brigsby Bear Adventures has an audience of exactly one: the kidnapping victim its been custom-made to educate and entertain. All of which makes Brigsby Bear sound like something darkly complicated, pushing down a path parallel to warped-upbringing dramas like Room and Dogtooth. Instead, it turns out to be much more… huggable than that: a quirky sitcom recovery fable about transforming our childhoods through art to overcome them. Will James, like the kid in Room, come to desire a return to his fake life over the messier, more challenging real one? Is his relationship to art forever sullied because he now expects everything he consumes to be personalized? Resonant questions bubble around the edges of Brigsby Bear. The film clearly sees James’ devotion as a metaphor for the intense relationship some fans develop with their favorite entertainment, their loyalty to the work shaping (and narrowing) their worldview. At the same time, the character reflects nostalgia for an era of less hostile fan culture; James may be unhealthily fixated on the chintzy, public-access-grade space opera of his youth, but his adoration never curdles into nerd-rage protectiveness—he genuinely wants to give Brigsby to the world. Still, in celebrating the “purity” of James’ love for the show, Mooney denies this childlike fish-out-of-water any deeper layers of anxiety, dread, or anger. His trauma remains abstract. 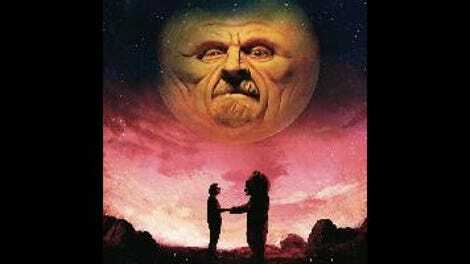 There are hints of the more soulful fairy tale Brigsby Bear might have been—in the melancholy scene where James hunts down the starlet (Kate Lyn Sheil) his father deceptively (and somewhat improbably) cast in a long-running Brigsby supporting role, as well as any moment with Greg Kinnear, warmly understanding as the detective on the case. In his attempt to make peace with the elaborate lie that was his life underground, James eventually makes the leap from enthusiast to artist, working out his complex Brigsby feelings—which is to say, his feelings toward his “old” mom and dad—through home-movie fan fiction. But the big finale never reaches Chuck & Buck levels of therapeutic catharsis, because Mooney hasn’t really let us see James’ pain, only his gushy wide-eyed innocence, his lovability. At one point in the film, James’ father reprimands Kinnear’s detective for humoring and even enabling his son’s Brigsby obsession, reminding him that the DIY show was a crucial tool in imprisoning and manipulating him. It’s a solid point he eventually forgets—and one that the movie, drunk on the adorkable love affair between man and his imaginary bear friend, never really takes to heart.